Samit Paul is Assistant Professor, Finance and Control. Indian Institute of Management Calcutta (IIM-C). 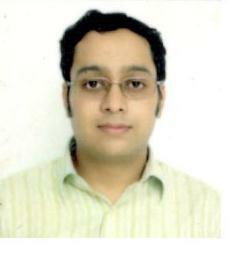 He has completed his fellowship from IIM, Lucknow in the area of Finance and Accounting. His primary research interests lie in the area of market risk management, volatility modelling and portfolio management. The entire world feels the rush of adrenaline and excitement of all nail-biting finishes when the biggest and most thrilling sporting carnival takes place in every four years. Yes, we are talking about the FIFA Football World Cup, which is the prime catalyst for a sleepless night, an endless fight and most importantly the win of might. For almost one month, the cheering fans on road, sold out hotels and fully packed bars and restaurants are the natural exhibitions for any country hosting this event. It clearly shows that with the kick start of the event, the economy of the host country experiences a positive twist. Therefore, analysing the direct impact of such event on host economy and its indirect impact on others are of much interest among the economists. Let us focus on the recent FIFA World Cup 2018, which has been hosted by Russia, the $1.3 trillion economy. In this particular tournament, 32 nations have participated from different parts of the globe. Five of the 10 largest economies are part of these troops. These 32 economies accounts for almost 35.73% ($31.26 trillion) of total world’s wealth. Combined per capita income of all of them amount to $18,945, which is 1.62 times better than that of World’s per capita income of $11,727. Euromonitor, the market research company, believes that this particular event will promote Russia as a preferred destination of tourists even after the end of World Cup. Mr. Alan Rownan, the sports industry manager of Euromonitor, expresses in a note: “The number of inbound arrivals in Russia is expected to record a compound annual growth rate of 4 percent by 2022, reaching 37.5 million trips”. It has predicted a 1.8% surge in footfall in Russia as a direct outcome of hosting World Cup. Naturally, along with gaining the pride of hosting the World Cup, Russia expects a major boost in economy especially in the industries of tourism, hotels, foods and beverages and constructions. In order to maximise such expected benefit the Russian Government has planned to invest large amount of money to make the event a grand success. According to the Moscow Times, Russia will exceed investing $14 billion in hosting the World Cup, surpassing the official cost of $11 billion that comprises transport infrastructure cost of $6.11 billion, stadium construction cost of $3.45 billion and accommodation cost of $680 million. This makes FIFA World Cup 2018 to be the most expensive football tournament in history. Despite this huge amount of investment, the host country is not expected to derive much benefit in reality. According to the rating agency Moody, this competition would create a very limited economic impact at the national level due to the very large size of Russia’s economy and the short duration of the World Cup. Hence, although Russia has experienced a healthy external accounts based on boost in tourism, the added support is only short-lived. Moody’s further add: “Much of the economic impact has already been felt through infrastructure spending, and even there the impact has been limited. World Cup-related investments in 2013-17 accounted for only 1 percent of total investments”. Therefore, one may be curious to know the different factors that outweigh the economic benefits provided by such gala event. Moreover, another important question is whether this short-lived, not so impactful World Cup event is only specific to large economy like Russia, or such impact is inevitable everywhere else? In order to explore this, it is better to look at the similar historical events and analyse those post-event scenarios. One of the prominent reasons is opportunity cost. The money invested in infrastructure building should be justified on the ground that it would bring economic boost in short term and steady growth in long term. The investment in sporting infrastructure is not really useful for economic well-being of an average worker. For example, most expensive stadium of Brazil, which has been constructed before FIFA World Cup 2014, is currently being used as a parking lot. 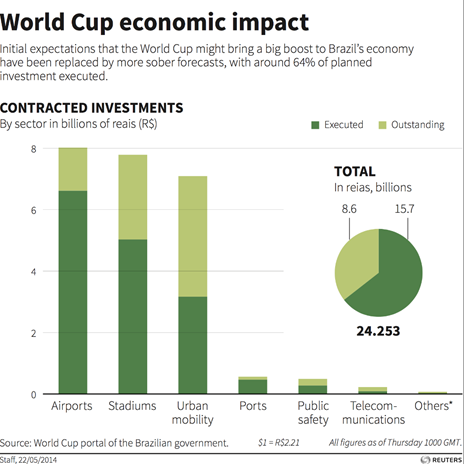 Although initially the expectation from this World Cup was very high, especially as Brazil is a representative of emerging economy, only 64% of the planned investment has been executed. The auditors have concluded that with such amount of money more than twice of annual social welfare bills of Brazil could have been paid. The similar criticisms had been raised before the FIFA World Cup 2010 which was hosted by South Africa. Economists argue whether money invested in the process could have been better utilised in development of impoverished communities. Although popular sporting events attract huge number of sports fans, may also disrupt the regular tourist flows. Tourists may be driven away towards less crowded and less expensive destinations. After the Beijing Olympic 2008 and London Olympic 2012, both the cities had experienced a year-on-year decrease of visitors. Even most popular British museum saw 22% less visitors during the month when the games were held. Moreover, some spending is associated with the process of attracting sports fans. Therefore, in case the footfall does not match the expected figure, the possible economic benefits get washed away. Sharing of revenue with the governing bodies is another major concern for the local organizers. Various revenue streams such as sales of merchandise, sponsorship, gate receipts provide some earnings to the local organizers, but those are really not significant. The hefty share of revenues that are earned by television rights largely goes to the governing bodies. FIFA has generated almost $5 billion revenue from World Cup 2014, More than 50% of such revenues have been generated from television rights. 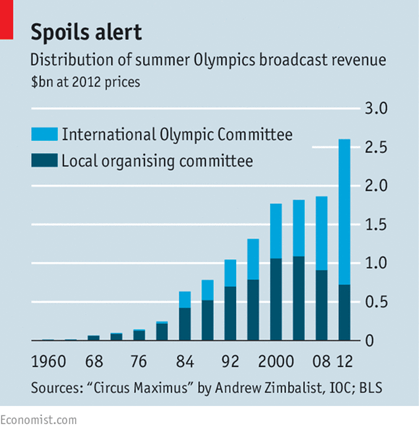 Andrew Zimbalist, the famous economist, has shown that the International Olympic Committee (IOC) now earns more than 70% of revenue from television rights comparing to 4% that has been earned between 1960 and 1980. Although this factor may not be that much significant compared to others as listed above, it may be worthy enough to explore in context of World Cup 2018. Brazil, the most populous participant in this World Cup, is ranked 5th in world population wise. Therefore, top four countries in term of population are not there in this tournament. Only 5 among these 32 nations have more than 100 million citizen per country and 9 countries have population less than 10 million each. It may have an indirect impact on the number of visits and economies of scale of this particular mega show of football. Although the reasons cited above may play a crucial role in offsetting the expected economic benefit, the impact of World Cup 2018 is not only confined to the host and participating countries. It stretches out much beyond its geographical boundaries. Fan IDs provided to ticket holders in order to get visa-free entry and avail free rides on inter-city trains and public transport attract people from non-playing counties like India also. Those who are not on travel to Russia, are riveted on their screens. The TV sales in India has experienced a sudden spurt just ahead of the World Cup, especially in West Bengal, Kerala and the Northeast. Panasonic India has already reported 50% sales growth in the past month. Micromax has predicted a 25% increase in sales by end of June and LG electronics has found the sales to be doubled in certain parts of country. Nidhi Markanday, the Director of Intex Technologies, has quoted: “This year, the rub-off of football fever is being felt across Indian cities unlike earlier when it was restricted to East, North-East, Goa, Kerala and Maharashtra and we have witnessed a spurt of 10-15 per cent in our sales over and above normal CAGR growth in LED TV segment”. Along with the growth in sales, the investment in innovation by the TV makers is also one of the important features of FIFA World Cup 2018. To give better feels to the audience, most of the industry players have launched large screen size models. Sony India has launched new BRAVIA OLED A8F to provide enhanced games watching experience to the customers. On the other hand, Samsung has started World Cup focused campaign with its new versions of QLED TV with screen size of 55 and 65 inches. Along with such demand of new and upgraded TV sets, viewership of this event has accelerated significantly. According to the Broadcast Audience Research Council, the World Cup 2018 has reached 31.6 million viewers for the three games in first week, whereas the reach was only 14.9 million in five games a week in last World Cup. It is expected that the viewership will be much higher once the ball will be rolled at knockout stage. Sony Pictures Networks India (SPN), the official broadcaster of the FIFA World Cup 2018, has roped almost 15 brands as associates. These include brands like Association of Mutual Funds in India (AMFI), Hero, Honda Motors, Parle Agro, Castrol, Apollo Tyres, Uber, Indeed etc. According to the media agency executives, SPN may end up collecting 175-200 crore from this World Cup. In spite of such gripping excitement about the World Cup across the country, there is no Indian sponsor for this biggest commercial sporting event. In contrast, China represents one top-tier partner (Wanda Group), three second tier sponsors (Hisense, Mengniu and Vivo) and three third tier sponsors (Diking, Luci and Yadea) in this World Cup. Chinese companies aim to get access to the Western audiences and to provide their brands a cosmopolitan image. Time will tell whether Indian companies, who want to expand globally in future, have missed a trick here. Ricardo Fort, the global VP of Coca-Cola, the longest running sponsor of FIFA, has told: “It is getting increasingly important to be at events such as FIFA; Live sports is one of the few things that people stop and pay attention to what you are saying ”. Being a part: Does it matter? It is imperative to understand whether only the economic benefit is to be considered before being a part of this mega commercial event either as a host or as a participant or just as a sponsor. Goldman Sachs has shown that at least in short term the stock markets of host country and the winner of World Cup experience an upward movement. However, many hosting countries do not often focus upon stock market moves or cost of hosting. Rather, they consider this to be an avenue to send signal to the rest of the world about their policies, culture or nation building strategy. Therefore, it is not always fair to judge the success of such event by hard numbers and statistics. The sporting event like World Cup is one of the very few things that bring the whole world together. It has the ability to cross many social and political barriers across caste, creed, religion and countries. Moreover, it acts as a storehouse of feel-good factors, stories to inspire children and youth to take up sport, and more importantly unconditional love stored for a nation. Hence it’s better to conclude with the following quote by Pope John Paul II: “Among all unimportant subjects, football is by far the most important”.